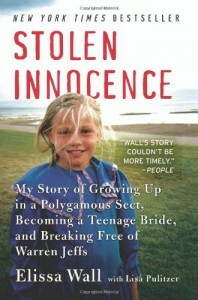 I read this book last year after seeing a little blurb about it in a magazine, and found the polygamous lifestyle fascinating to say the least. It's hard to picture how this completely hidden world works until you read about it for yourself.There has always been something about alternative lifestyles that makes me curious to find out more about how they tick. This book is a good peek at that world. One young girl is raised in a world where she is taught to fully obey her group's "prophet," even at the expense of being forced into a marriage to her cousin at the age of 14.When she meets another member of the group and falls in love, they find the courage together to escape the life and later testify against cult leader Warren Jeffs.I just realized that it says "CD" and I didn't listen to the book, but am too lazy to fix it.